How do you like to eat them? Use a fork, or get those fingers sticky? Gradually unroll, or just bite into it? 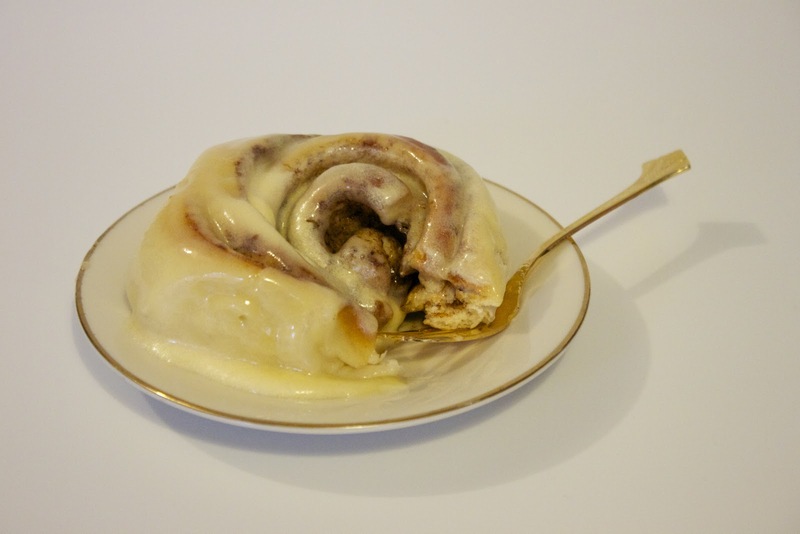 Cinnamon buns are a firm favourite in my family, and we all have our own way to eat them. My daughter likes to unroll hers and cut little bits off, while my son likes to take big bites out of his, in his words, "the same way I eat hamburger." These buns come out deliciously soft and squidgy, dripping with gooey cinnamon syrup and drenched in rich cream cheese frosting. You never have to worry about left overs If you have any leftovers, they still taste great the next day, just store them in an airtight container and warm up individually in the microwave for 30 seconds.I like to make the dough in my bread machine - while it doesn't reduce the preparation time (at least 3 hours), it does require less of my time and attention and I can get on with other things, and they come out perfectly every time. If you prefer to though, there is no reason why you can't make it by hand. Note: it is a very soft and sticky dough. Place all the dough ingredients in the bread machine in the order recommended by it's manufacturer. I add dry ingredients first in my current machine, but my previous machine required liquids to be added first. The dough should rise until it has has doubled in size after the kneading is done, I usually have to leave it a further 30 minutes after the machine has finished. Make sure you have enough surface area to roll out a 23x15" rectangle of dough. Measure out the cinnamon and sugar for the filling and melt the margarine. Line 3 8" square high sided tins. Get out a tape measure, some dental floss, a rolling pin, a basting brush and flour for dusting your surface. Preheat your oven to 195°C. Stretch the dough out on a lightly floured surface into a rectangular shape, and then roll it out into a 15" by 23" rectangle, with the 23” side running left to right. Try to keep the sides as straight as possible, measure across the narrowest point. Brush the melted margarine over the dough, leaving a 1" clean space along the edge furthest from you (this is used to seal the roll), then sprinkle over the sugar and cinnamon and rub in slightly. This filling forms the syrup, so you want to make sure all of the sugar and cinnamon is moistened by the margarine. Brush the clean edge with a little water, then roll the dough up towards that edge. Measure your roll to make sure you still have 23" (excluding the uneven bits sticking out the ends), if it has shrunk a bit, gently roll it to stretch it out. Trim one end of the roll so that it is ‘square', then mark the roll every 1 1/2 inches from the square end. 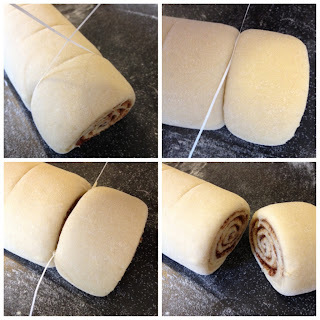 Now cut the roll on the marks by slipping a piece of dental floss under the roll, bringing it round crisscrossing it and slicing the dough off neatly. This is the best way to keep each bun neat and even, but you can cut them with a very sharp knife too. You should get 15 buns. Place 5 buns into each tin, evenly spaced from each other and the sides of the tin. 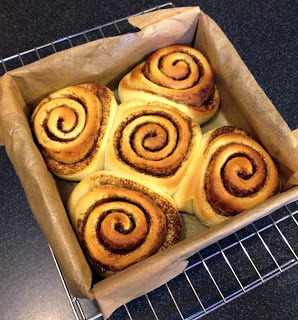 (One bun in each corner, and one in the center.) Cover and rise for 1 hour, when ready, the buns should be touching each other and the sides of the tin. 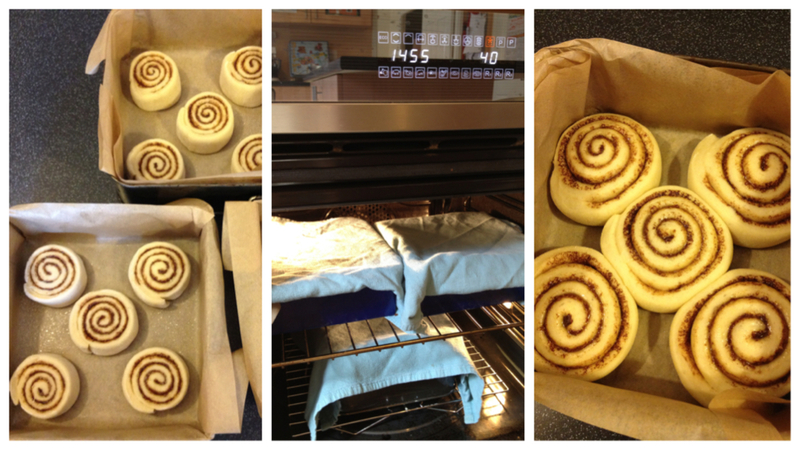 Bake at 195°C for 10 minutes, one tin at a time, they should be only lightly browned when done. 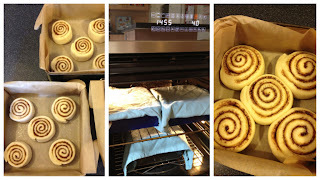 Remove them from the pan as soon as you can touch them and separate the buns from each other. Prepare while the buns are doing their final rising, before baking. 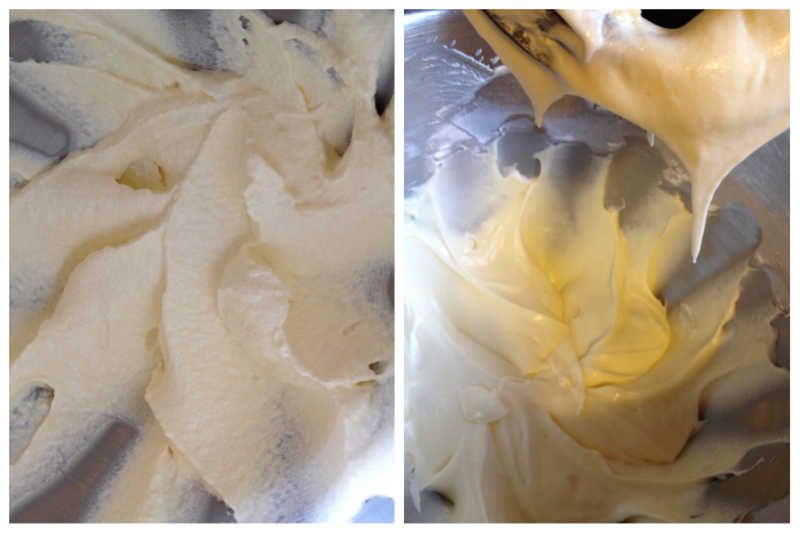 Beat the cream cheese and margarine on low until combined, then beat on high for 5 minutes to get it light and fluffy. It tends to look a little 'separated' at this stage, but don't worry, it will come together again. Add the icing sugar in parts, beating after each addition on low until it is combined. Add the vanilla and beat for another minute. Split the icing into 3 portions, ready for when the buns come out of the oven (otherwise I tend to be a bit heavy handed on the first batch and don't have enough for the last).Spread the icing over the buns while they are still hot so that it can melt down into the buns, making them delicious! Best eaten while still warm.